Arroyo Grande, CA – June 17, 2015—May home prices rose to five-year peaks in the Central Coastal counties of San Luis Obispo and Santa Barbara while home sales soared nearly 15 percent and set a new record for the Ventura region, according to the latest market analysis from CENTURY 21 Hometown Realty. For the third straight month, strong demand drove up sales and prices simultaneously in the Central Coastal region. Home sales rose at an annualized six percent over 2015 and 3.3 percent over April. Rising prices pushed the region’s median sales price to $428,000, up 12.5 percent over prices a year ago and less than one percent over April levels. Strong demand shortened the time homes spent on the market. Farther south, May sales and prices both set new records in the three-county Ventura region. Sales rose 14.6 percent over 2015 and 6.8 percent above April levels. Prices for the region reached a median of $476,000, a new five-year high, up 14.7 percent from 2015 levels and 1.5 percent higher than the April median. Homes are selling much faster, settling in on 63 days. “Low-interest rates and ample inventories are motivating buyers across Central Coastal and Ventura markets this season. Home prices are setting new records, and new listings are coming on the market priced higher than the previous month. Homes are selling even faster in May than they were in April, creating great opportunities for sellers. Demand has not faltered, and sales continue to be well above last year’s levels. With these market dynamics in place, home sales and prices could break even more records in June,” said Amy Gallagher, corporate broker of record for CENTURY 21 Hometown Realty. Prices in San Luis Obispo County reached a new median of $499,500, up 10.4 percent from 2015 and .5 percent above April price levels. Annualized sales in the county rose 6.1 percent year over year but were down 3.9 percent from April. Houses are taking an average of 95 days to settle in the county, 12 percent faster than in April. In San Luis Obispo city, closed sales in May soared by 83.8 percent over sales a year ago and 23.6 percent above last month. The median sold price reached $816,000, up 5 percent from 2015. Sales rose 5.5 percent above 2015 levels and 17.7 percent last month’s level in Santa Barbara County. Median prices rose 10.4 percent on the year and finished the month .5 percent higher than April. Homes in the county sold an average of about 10 percent faster in May than April. In the Ventura region, home sales are reaching new heights. Some 19,050 homes were sold in May for more than $12.7 billion, a new five-year record. Homes are spending a median period of only 21 days on the market before they are under contract, selling faster than any month since the housing boom. Though the regional sales were strong in May, sales in Ventura County proper were soft. Sales fell 16.4 percent from 2015 and 8 percent from April levels. Prices rose modestly, up 5.1 percent over 2015 and 1.1 percent above April. The median sa.e price for the county reached $536,000 in May. Every Memorial Day weekend Arroyo Grande holds one of San Luis Obispo County’s largest free and memorable festivals – the Strawberry Festival. The historic, picturesque village of Arroyo Grande has held this festival for decades, with this year being it’s 33rd time! Its bustling downtown nature and characteristic roaming rooster population provides the perfect backdrop for this upbeat gathering. This festival is the primary fundraiser for the Arroyo Grande Village Improvement Association which also presents many other entertaining festivities throughout the year. This bright and bubbly festival is ideal for families and couples alike, bringing together hundreds of tourists, visitors and residents to relish the entertainment and festivities. Whether it’s live music, foods, displays or the abundance of all things strawberry-related, you’re sure to find something to fit your tastes and tastebuds! Stop and explore the fantastic local eateries, bars and shops during this annual celebration. For those who don’t mind getting a bit messy, take part in the famous Strawberry Stampede this Sunday- walk or run 5 or 10k! The Strawberry Festival isn’t just food related – There’s entertainment in all forms of music and dance related acts performing across a whopping eleven stages! Music comes in all genres whether you like rock ‘n roll, jazz, or folk and blues. Look on as they crown the Prince and Princess of the Strawberry Festival, alongside the carnival rides lining the streets, and a multitude of arts and craft shows nestled between the abundance of antique and vintage stores along the streets of Arroyo Grande. There truly is something for everyone! Download the schedule and map for the weekend here! Arroyo Grande, CA – May 26, 2015—April home sales in Calfornia’s Central Coast and Ventura regions rose briskly for the second consecutive month, reaching new heights for the year. Strong demand set five-year price records in San Luis Obispo County and the Ventura Region, and homes sold faster than they have in years in several Coastal Counties and the entire Ventura Region, according to the latest market analysis from CENTURY 21 Hometown Realty. In the Central Coastal Region, Sales in San Luis Obispo and Santa Barbara Counties rose 5.9 percent over March and were 8.6 percent higher than in April 2015. Median home prices rose 2 percent over March and were 4.9 percent higher than in April 2015. At 72 days, the median time to settle in the region was the fastest since last April. Strong sales and rising prices motivated sellers to list their homes, and inventories of homes for sale finished the month at the highest levels in six months. In April, sales in the four-county Ventura Region rose 5.9 percent over March and 6.3 percent over sales in April 2015. The median sale price for homes in the region set a 5-year record, at $469,000, up 3.3 percent from March and 13.3 percent above the median sale price in April 2015. At a median of 63 days to settle, homes in the region sold at a slightly slower pace that in March. “Strong demand this spring is driving up sales at a healthy pace and setting price records in some markets. Properties throughout the region are selling in six weeks or less, motivating sellers to list their homes. Healthy inventories throughout the Central Coast and Ventura regions provide buyers a wide choice in the months to come,” said Amy Gallagher, corporate broker of record for CENTURY 21 Hometown Realty. In April, CENTURY 21 Hometown Realty closed on 153 homes worth $64,709,500, bringing its total year-to-date sales to 429 homes worth $174,930,039. The firm’s top selling agents in April were Eddie Stanfield, Tom McNeill, Tim Riley, Christa Lowry, Kelli Marrufo, Billie Jean Chadwick, Louise Dickenson, Michael Casaceli, Byron Grant and April Hugh. In San Luis Obispo County, sales were on fire in April. Some 362 homes sold during April, 7.7 percent more than in March levels and 23.7 percent above total sales in April 2015. Though median prices rose only 0.4 percent during the month, they were 7.1 percent higher than a year ago and at $497,000, the county’s median price set a five-year record. Homes sold at a faster pace in the county than they have since October 2013, settling in a median time of only 71 days, 2.7 percent faster than March. Despite strong sales, active listings in the county increased 7 percent during April, the largest inventory level since last April, providing a wide choice for home buyers in May. In San Luis Obispo city, prices hit their highest level since last October, reaching a median of $589,000. Sales were up 22.2 percent over March but trailed the record sales recorded last spring by 8.3 percent. Inventories of homes for sale closed the month at the highest level since January 2013. San Luis Obispo is blue; Santa Barbara is red. Sales in Santa Barbara County also rose on a year over year basis, but at a slower pace than Sab Luis Obispo County. Sales were just 2.3 percent higher than they were a year ago but they fell 12.6 percent from March levels. At $349,900, the county’s median price was 9.7 percent over 2015 levels and 1.4 percent higher than March prices. Homes in Santa Barbara County settled in a median period of only 73 days, selling 9.9 percent faster than in March. Active listings of homes for sale in the county were 5 percent higher than they were in 2015 and 1.6 percent above March inventories. Sales in Ventura County fell 1.8 percent from March and 17.5 percent from April 2015. However, at $530,000, the median sold price set a five-year record. Prices were up 8.4 percent over April 2015 and 5 percent over March. Homes sold 1.5 percent faster than in March, settling in 67 days on market. The county ended the month with the largest inventories of home for sale since last August. In Ventura city, sales were down 12.5 percent from a year ago and 2 percent from March. However, sold prices rose 3.3 percent over a year ago, reaching a median price of $470,000. Homes settled in 82 days, 9.9 percent faster than a year ago and 8.9 percent faster than in March. Spotlight on the Central Coast is a new series of blog posts giving an insight into what is hot on the Central Coast of California right now! Whether it is resorts, outdoor activities, or food and drink, picking a real estate agent who is insightful into the locale and what it has to offer is essential! Lido, the resort’s award winning restaurant is one of the most sought after dining experiences on the Central Coast, offering stunning views of the Pacific. Their cutting edge menu, masterminded by executive chef Jacob Moss, proudly showcases local and organic farm-to-table cuisine with daily chef’s tasting, tapas Tuesdays and unbelievable daily drink specials. Delight your senses at the spa at Dolphin Bay, where you can treat yourself to a wide variety of treatments, from massages to full body-exfoliation to biotec facial treatments. Their beautiful, state-of-the-art facility is the ideal place to unwind. Dolphin Bay also offers sumptuous suites, with all the comforts of home, including aire-jet tubs, fireplaces, and kitchens with granite-top counters. There are one and two bedroom suites as well as penthouse accommodations for the ultimate resort experience. Whether you’re coming to the central coast for a romantic getaway with that special someone, or for family fun, Dolphin Bay is the perfect destination. The central coast has long been sought after as a postcard-worthy location for weddings, with its breath-taking backdrop of the ocean and majestic palms swaying in the background. Dolphin Bay offers exceptional service in hosting weddings, meetings, holiday parties and events of any size and taste. Nearby Pismo Beach offers nightlife and dining, as well as outdoor fun like whale-watching, surfing and kayaking. Of course, on the Central Coast, you’re never far from unique wine-tasting opportunities. Dolphin Bay is the perfect spot to enjoy it all in style, and right now they are running a limited mid-week 25% discount for any reservations made before May 26th 2016! Click here to book! Arroyo Grande, CA – April 15, 2015—The spring home buying season in California’s Central Coast and Ventura Regions kicked off with a surge of home sales and rising prices in March that exceed last year’s levels. A wave of new listings of homes for sale throughout the region promises that sales will remain strong through the spring and summer months and provide greater choice for buyers, according to the latest market analysis from CENTURY 21 Hometown Realty. In the Central Costal counties of San Luis Obispo and Santa Barbara, closed sales were 5.5 percent higher than they were a year ago and annualized prices were 3.3 percent higher. Homes sold nearly 10 percent faster in March than in March 2015, and active listings of homes for sale were 5 percent higher than they were in 2015. In March, the four-county Ventura Region posted an 11.7 percent sales increase over a year ago. The median sales price for the region rose 12.1 percent over March 2105 and reached a new five-year high at $454,000, With an influx of 27,127 new listings in March, supplies of active listings are 22.8 percent higher than a year ago. Homes in the region are selling in 26 days, the shortest time on market in more than five years. “We see very strong demand from buyers throughout Central Coast and inventories are keeping pace. In San Luis Obispo and Santa Barbara Counties, listings are more than 5 percent higher than a year ago. The Ventura region is on fire, setting records for prices and time on market. All signs point to 2016 being an extraordinary year for home sales,” said Amy Gallagher, corporate broker of record for CENTURY 21 Hometown Realty. The median price for homes sold in San Luis Obispo County reached a five-year high of $495,000, up 6.6 percent from March 2015. At $539,000, the median price for new listings in March also reached a new five-year high for the county, 7.8 percent higher than a year ago. Homes in the county sold faster as the spring buying season got underway. Sellers are responding to higher prices. New listings increased 25 percent in March, and total active listings are 2.7 percent higher than they were a year ago. The median price for new listings is $539,000, 3.9 percent greater than in February. In San Luis Obispo city, sales were down 13.5 percent from a year ago but rose 12.5 percent from February. The median sales price dropped 4.4 percent from a year ago, to $569,000. In Santa Maria, sales shot up 22,6 percent over last year and 65 percent over February. Prices rose 11.7 percent over last year. At 217 homes, active listings are flat but lead 2015’s levels by 1.9 percent. Santa Maria received about 15 percent fewer new listings in March than it did a year ago. Both March sales and sold dollar volume rose 24 percent over last year in Santa Barbara County. Sales were up 97 percent over March. The median sold price rose 8.9 percent over the previous year as the county’s median price reached $345,000. Santa Barbara County is experiencing inventories smaller than last year. Days on market were up 21 percent from last year to 81 days. Active listings trail last year’s level by 10 percent and new listings are down 8.1 percent from a year ago. San Luis Obispo is red; Santa Barbara is blue. Sales rose 51.5 percent in Ventura County over February but fell 5.6 percent below sales in March 2015. The median sold price in the county rose to $505,000, an increase of 9.3 percent from February and equal the median sales price a year ago. Homes are selling faster in Ventura County even though total listings increased slightly, by .7 percent. Home sales contracts are closing in 46 days, down 6.1 percent from a year ago. Median days to settles takes 66 days, the same as a year ago. Sales bounced back to December levels with the onset of spring. Sales in Ventura City fell 8,1 percent from a year ago but were up 41.7 percent over February. Prices rose 15.1 percent over 2015 by fell 3.9 pedcn5 from March. Homes are selling faster in Ventura than last year at this time, 44 days until a contract is signed and 66 days to settle. Arroyo Grande, CA – March 14, 2015—Home sales in California’s Central Coast and Ventura Regions declined along seasonal patterns in February, typically the region’s slowest month for sales, but brisk pending sales promise a rebound in the coming months. Prices throughout the regions stabilized at about 12 percent above price levels February 2015, according to the latest market analysis from CENTURY 21 Hometown Realty. In the Central Coastal Region, monthly sales fell 12 percent and were 5.3 percent below sales in February 2015. Pending sales—homes under contract—rose 31.2 percent during the month, 5.1 percent more than a year ago. Median sold prices rose 1.2 percent from January and reached $440,000, 12.1 percent higher than a year ago. February sales in the four-county Ventura region declined 4.2 percent from January but are still 12.5 percent higher than they were a year ago. Ventura prices fell less than 1 percent in February but are l1.8 percent higher than they were in February 2015. New listings of homes for sale increased in February at rates higher than a year ago. In the Central Coastal Region, new listings increased 8.6 percent over January and 13.8 percent over a year ago. In the Ventura Region, new listings rose 8.67 percent, 13.8 percent more than a year ago. “The coming sales season is shaping up to be a good sellers’ market. New listings are building local inventories at faster rates than last year throughout the region, a good sign that buyers will have a wider choice of homes throughout the Central Coast. These new homes on our local markets is will help to stabilize prices and increase sales in the coming months,” said Amy Gallegher, corporate broker of record for CENTURY 21 Hometown Realty. February closed sales in Sam Luis Obispo County fell 10.4 percent and were 2.3 percent below last year’s level, but new contracts rose 31.2 percent during the month, a 5.1 percent increase over last year. New listings rose 17.9 percent during the month as sellers listed their homes for the spring season. Median sold prices for single family homes in San Luis Obispo County reached a five-year high of $485,000, up 5.4 percent from January and 9 percent higher than a year ago. The average price for sold homes in the county is $404,950. In San Luis Obispo city, the median sales price rose even higher than the county median, to $$555,106, up 3.4 percent from January and 2.6 percent from a year ago. Sales increased 42.9% over January, on a small base 28 sales and new listings rose 32.6 percent during the month. Sales in the Central Coastal counties declined in February, traditionally the slowest month of the year. Sales fell 15.1 percent in Santa Barbara County in February and were 10.8 percent below levels of a year ago. However, pending sales for the month indicate the market is reviving from the slowest month of the year for home sales. Pending sales rose 35.3 percent over January and were 9.3 percent higher than February 2015. Prices in the county achieved double-digit gains on a year over year basis for the second month in a row. The county’s median sales price of $352,000 was 2.3 percent higher than January and 13.9 percent higher than a year ago. Inventories in Santa Barbara County are growing faster than they were a year ago, setting the stage for a busier sales season the last year. New listings rose 25.3 percent over January and 13.9 percent over levels of a year ago. Active listings reached 110 for the month, slightly below the five-year average of 134 homes for sale in February. Despite a decline in sales in February, this year Ventura County prices have remained strong in the winter months. February closed sales in Ventura County fell 2.8 percent for all housing types and were down 2.4 percent on the year. Pending sales rose 19.4 percent over January as activity increased. Prices declined slightly by 2.3 percent during the month to a median price of $505,000 for all housing types. New listings joined local inventories in the county at the rate of 17.7 percent in February, slightly lower than last year. However, more than 1700 homes are listed in the county, higher than the five-year average of 165l. Thousand Oaks saw stronger sales and prices than elsewhere in the county. Sales declined only 1.7 percent from January and are still 23.9 percent above last ear. Prices rose for the third straight month, reaching a median of $651,000. CENTURY 21 Hometown Realty is the leading real estate firm on the central coast. Since 1947, it has supported the needs of home buyers and home sellers throughout California’s Central Coast region with 19 branch locations in San Luis Obispo, Santa Barbara and Ventura Counties. Our offices cover the California Coast from Paso Robles in the north to Camarillo to the south. We offer specialty services including Luxury Real Estate, Agricultural and Ranch Real Estate, Vineyards, Ocean Front Real Estate, Commercial Real Estate, and Residential Real Estate. Our agents have keen focus on these areas and multilingual and generational expertise. Visit our website at C21Home.com to see our California listings and our office locations. Whenever we get out of town, we commonly are faced with a dilemma when people ask where we are from. Most people around America have never heard of San Luis Obispo County. We typically end up telling people that it is halfway between LA and San Francisco. For most, that is a good enough answer. Although SLO County residents know that this is one of the most prized places to live in the world, it is not a well known. Perhaps that is what makes makes it more special than famous counties like Napa County, Santa Barbara County, or San Diego County. Tourism is one of our biggest industries along with government and agurculture, and that is likely to remain true for years to come. It does not hurt when the New York Times does a feature story on the area. It is very difficult to be quick to call the beginning or the end of any type of major economic cycle while it is happening. But it is pretty easy to call it when it is over. 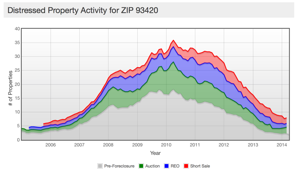 This 10 year report by CoreLogic shows the depth of the housing crisis in one of our central coast zip codes, 93420. As you can see, the slope of the housing tragedy for too many homeowners has largely dissipated at the same pace. It is interesting to note that the Auction rates, REO rates, and short sale rates were pretty steady though out the entire cycle. A short sale is when the homeowner and the bank agree to sell the property for a price below the loan value. REO and Auctions are mostly a result of a bank foreclosing on a property or a homeowner’s strategic default. For most homeowners who have stayed in their property through the crisis, the value of homes have returned to 2006 prices. Indeed, today’s home market sees home prices continuing to rise as a result of demand outpacing supply. There has been very little new home building in our county but our population continues to grow. This market is also influenced by the global demand for California property. The central coast offers the most value and highest quality lifestyle in the state (or as many magazines suggest, the best place to live in the nation!). Be sure to check out the community pages to find out what is happening in the housing market where you live.